Our aseptic biomedia bags are manufactured by a leader in the design and manufacture of single use/flexible bags/containers for the pharmaceutical and biotechnology industries. We offer a wide variety of biomedia containers to help speed your product to market - quickly and effectively. 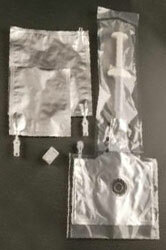 These bag systems are used most commonly to contain pH sensitive sterile liquid cell culture media, salt solutions, serum products, cellular cultures, buffer solutions, and artificial nutrient liquids. Our standard and custom bags systems are offered in a broad range of Class VI Medical Grade materials incorporating cutting edge technology in 250 ml to 3,000 liter sizes. Additionally, we offer a complete range of contract manufacturing services are offered which include: Product design/prototyping, in-house tool design, clean room injection/insert molding, assembly, packaging, sterilization & private labeling. Specifically, mold building and injection molding capabilities allow us to meet each private labeling customer's exact specifications with competitive pricing and short lead-times. Whether it is a revised bag die or a new injection molded component, we are committed to meeting your deadline and exceeding your expectations. Our manufacturing facility is equipped with the latest equipment, and all our products are manufactured and assembled in a class 10,000 HEPA filtered cleanroom to meet the highest quality standards. As an ISO 13485:2003 certified, FDA Registered (#2523689) medical device manufacturer, we adhere to current Good Manufacturing practices (cGMP's). All manufacturing materials and processes are qualified in accordance with cGMP's, United States Pharmacopoeia (U.S.P.) Class VI Plastics, American Standards Test Methods (ASTM), and International Standards Organization (ISO). The film structure of the Biomedia Bags consists of films specially formulated to provide strong seals, extraordinary robustness, superior flex, crack, and pin hole resistance, and desirable gas and moisture barrier performance. The line of Standard Biomedia Bag Systems that are offered by Leading Innovative Products and Solutions will fit most standard applications. If you do not see a standard bag that meets your specific requirements, we can develop a custom biomedia bag or system for you through our Customization by Design Program. 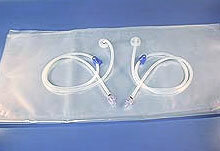 Sterile Bag System made from Multi-layer Polyethylene with Two 5' Silicone Tubes with Clamps attached to a Male and Female Luers & Caps. 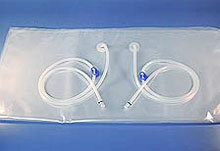 Sterile Bag System made from Multi-layer Polyethylene with Two 5' Silicone Tubes with Clamps attached to a Male and Female CPC Connectors & Caps. 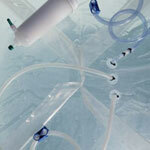 Sterile Bag System made from Polyethylene/EVA Coextrusion with Two 20' Silicone Tubes with Clamps Attached to a Male Luer & cap and a Female Luer & Cap, along with a Medicinal Sample Port. 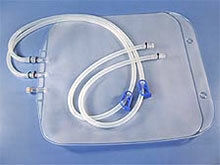 Sterile Bag System made from Polyethylene/EVA Coextrusion with Two 20' Silicone Tubes with Clamps Attached to a Male CPC Connector & Cap and a Female CPC Connector & Cap, along with a Medicinal Sample Port. 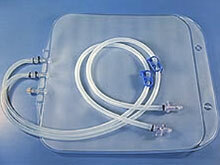 Sterile Bag System made from Polyethylene/EVA Coextrusion with a Male CPC Connector & Cap and a Female CPC Connector & Cap, along with a Swabbable Valve. 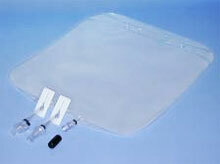 Sterile Bag System made from Polyethylene/EVA Coextrusion with two 1/4 inch Barbed Connector, Dust Cover Cap and Swabbable Valve. 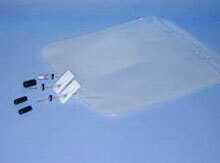 Sterile Disposable liquid holding liners for Nalge or competitive tanks. 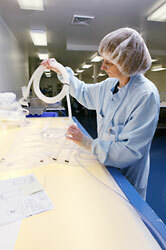 Tubing Ports are used to attach various tubing configurations to the Biomedia Bags for filling or dispensing. Inlet and outlet ports can be placed virtually anywhere on the bag to accommodate the in-flow or out-flow of fluids, re-circulation, mixing, or other applications. After your products has been designed, assembled and packaged, we can further manage the sterilization and validation of it. We work closely with several companies to sterilize your product via gamma radiation. We can further manage the validation that is required to insure your product meets and exceeds the highest industry standards regarding sterility and validation. Disposable IV/biopharmaceutical bags are offered in a wide range of class VI films and sizes including 25 ml to 2,000 liters for the storage, mixing and transporting of liquids. All medical disposables are assembled in a class 10,000 clean room adjacent to a class 100,000 state-of-the-art medical injection molding facility. View our website to gain an understanding of the advantages of the many options that are available from Advanced Scientifics. From the consultation, specifications will be developed into an AutoCAD drawing. The AutoCAD drawing will be sent via e-mail or fax for review. Upon approval of the AutoCAD drawing, a prototype will be provided for testing and validation. Upon approval of the sample, a Customer Specific Product Number we be assigned, and the production of the Customized Bag System will commence. Expected Lead Time 2 - 3 weeks* from order to delivery (Sterilized). * Lead times may vary. As an FDA registered, ISO 13485:2003 certified contract manufacturer, the Advanced Scientifics team is committed to producing a high quality product. 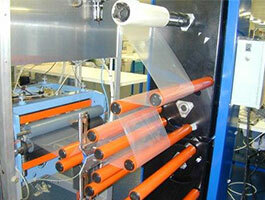 For us, value is the combination of delivering high-quality, functional products, on time, at a competitive price.